- What is the correct temperature to reach when annealing? – How long should you take to get to that temp and how long should you remain there? – How frequently should you anneal? – Can you ruin your expensive brass? – How do we make the process repeatable for the handloader? 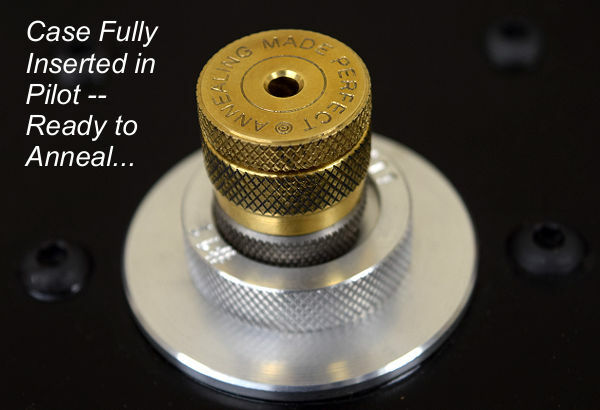 – How do you accurately measure the case hardness? They worked closely with the Electrical Engineering Department at the local University of Technology and invested a lot of capital into detailed metallurgical research. Their decision to use induction heating was because of its repeatability and the ability to reach exacting and consistent temperatures. Induction annealing is achieved by placing the cartridge in a magnetic field thereby inducing eddy currents within the brass and heating the brass without contacting the brass physically. To learn more, I suggest you visit the AmpAnnealing.com website. It is very informative. Why should you anneal? 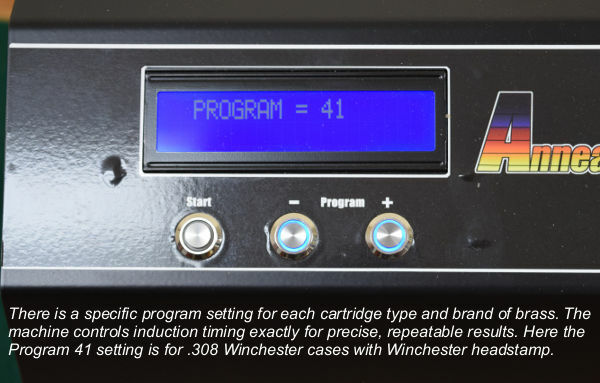 If you are just a casual reloader, than annealing isn’t necessary but if you a serious wildcatter or competitive shooter you may want to consider it. More and more competitive shooters anneal their cases (not necessarily for adding life to the cases) to achieve more consistent pressures and velocities. My first favorable impression was received by just opening the extremely well-packed shipping box. You could tell these guys take a great deal of pride in their product. The unit comes with three cartridge-specific pilots (you decide on which pilots), a shellholder collet, a power cord, a thorough, well-written, easy to follow instruction manual, and a USB cord for future software updates. This machine is so easy to use that I was up and running within a few minutes. All I had to supply was the shells, the correct shell-holder and an aluminum pan to drop the hot cases into. I started annealing some unturned .308 Winchester cases (Lapua headstamp) that had four firings. First I screwed the pilot for .308 cases (#11) into the machine, placed my .308 shellholder into the supplied shellholder/collet and turned the power on. The display fired up right away and soon registered the program level that the machine was set to. Since the machine uses induction heating, you need to set the heating level for the correct setting for the brass you are using. The alloy being used isn’t as important as the thickness or amount of brass in the neck and shoulder region. For example, Lapua and Norma have more brass in that area so the setting would be higher for these brands than Winchester brass. Also, if you have neck-turned brass, the setting would be reduced from the standard setting because there would be less mass in the air gap. The settings are obtained by referring to the “Settings” section on the AMP website and are broken out by cartridge, brand, standard unturned cases, and then neck-turned cases with various amounts of wall thickness removed. A great service that AMP provides to the handloader is that you can send sample cases of your brass to them (U.S. location in Wolcott, Indiana) and they will test the hardness for you and send you the exact setting for your specific lot of brass. My setting for unturned Lapua .308 Winchester brass was “92”. The buttons on the front of the machine allow you to adjust the setting quickly. After you set the program number, the setting is locked in after the first use until you change it again. 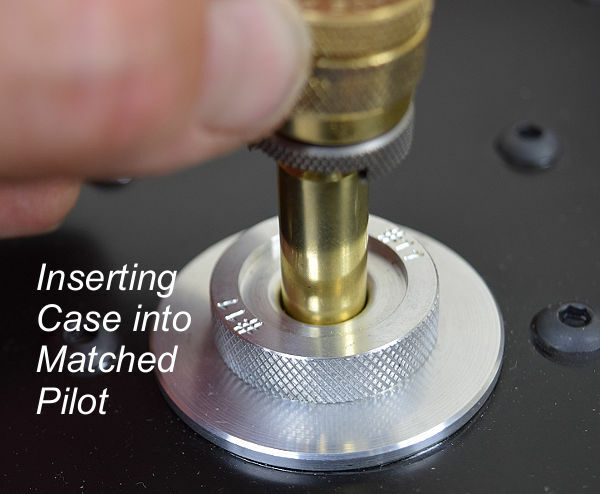 I placed the first case in the shellholder, lowered the assembly down through the pilot and into position. I then hit the start button which illuminated immediately and then about 6 to 7 seconds later, the light went off signaling that heating was completed. Now, be aware, these cases are extremely hot. I lifted the case out using the shellholder/collet and then dropped it into my aluminum pan. I then placed another case into the holder, put it into the machine and then repeated the process. Once I got the coordination down, I did 100 .308 Win cases in about 24 minutes. 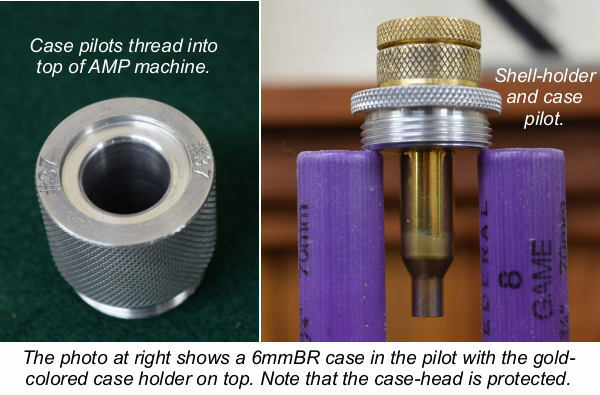 I did some 6mmBR cases later (Lapua) and annealed 100 cases in about 15 minutes at the “75” setting. I found myself raising my shop stool a little higher than normal so I was at a comfortable height in relationship to the top of the machine. Very easy to do — I actually had a student do a few cases with me and she had no problem at all following the instructions. There is a thermal cut-off that prevents the machine from overheating. Depending on the setting, this can occur after 20 to 35 minutes of continuous use. When this has occurred, simply leave the machine on and the fans will cool it down so you can resume annealing. This isn’t surprising considering the amount of heat being generated. All in all, I found this machine extremely easy to setup and operate. Now, does it work? I have test batches of brass that I am going to run over the chronograph in 10-round strings. I plan on running at least 10 strings of annealed brass and 10 strings of unannealed brass out of the same lot, same number of reloadings/firings and out of the same gun. I plan on alternating annealed strings and unannealed strings with a cooling off period every 20 rounds. When I do testing, I have my wife pre-label my batches as Batch A and B so I won’t know what rounds I am shooting until I get back from the range. I’ll make the results available as soon as I can. My expectation is that velocities will be more consistent based on my understanding of the lab results that the Findlays have achieved with their Annealing Made Perfect machine. For more information, visit their website at AmpAnnealing.com. 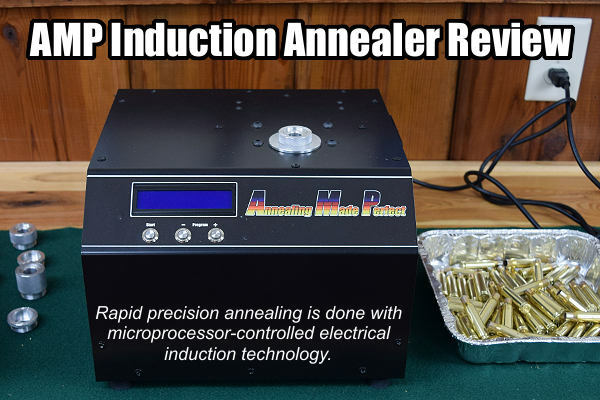 Share the post "AMP Induction Annealing Machine Review by Bill Gravatt"
It seems slick, until you realize that you’ll be hand feeding and removing every single piece. No thanks. Great write up, be interested to see your results. I also purchased one of these machines and it is simple to setup and use. I really like the fact also that there is no open flame in my reloading room. Has the testing been completed yet? Also purchased one. Very easy, well packaged, quality material and design. Flame work was a “guess” for me. I used all the proper temp paints and used my best judgment on “feel” once annealed. No guess with this product. You get a rhythm pretty quick. I too am interested in your test results. Have you tested your brass yet? I’m very interested to learn if you got a measureable difference in your SD between the annealed and non annealed cases. Hi Bill, I am very interested in buying one of these. where did you get yours? Has something changed since this article was published? I checked a couple of websites that sell the AMP and NONE of them sell the machine “with three cartridge-specific pilots (you decide on which pilots)”. For the price, $1099, that this machine costs it is disappointing that this is no longer seems to be the case. 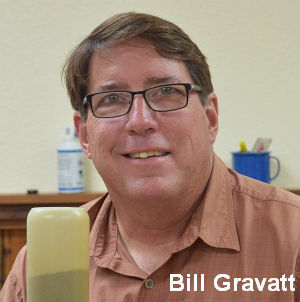 Editor: There have been some changes and upgrades to the machine and there is a new software feature that allows you to set, in about a minute, a custom profile for your specific brass.